An overview of the stages involved in the academic assessment and feedback lifecycle. The assessment and feedback lifecycle is an academic model showing a high level view of the academic processes involved in assessment and feedback. It is intended to be pedagogically neutral ie, it is more concerned with asking questions and stimulating thought than having a basis in any particular pedagogic stance. The model can apply to both formative and summative assessment and to any scale of learning from a three year degree to a short course that takes place over a single day. It covers all assessment and feedback practice whether or not materials are in digital format or supported by information systems. Within these processes there are variations between further and higher education with student tracking against outcomes, predefined by awarding bodies, being of great significance in FE. HE has its own set of quality assurance procedures around marking. Another important feature of the lifecycle is that it is iterative from both an institutional and student perspective. The reflecting element of the lifecycle is the final stage of one iteration. Learner reflection on the outcomes of one assignment should influence how they approach the next, and staff reflection on the outcomes of a cohort should influence the next iteration of course delivery. The lifecycle offers a ready means of mapping business processes and potential supporting technologies against the key academic stages. It provides a framework to gain a holistic picture of institution-wide activity and a means of encouraging dialogue between different types of stakeholders who may have a silo view of only part of the lifecycle. A means of clarifying requirements to system suppliers. The model is central to promoting shared understanding and dialogue amongst all of the many practitioners who collaborated with us on the production of this guide. 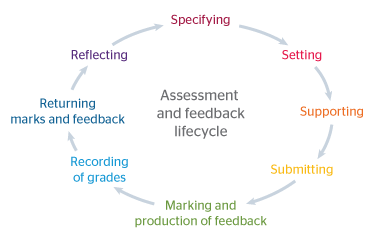 The assessment and feedback lifecycle was originally developed by Manchester Metropolitan University and it has been used and adapted by many other institutions since. You are free to use this model for your own purposes citing the creative commons license. See how Sheffield Hallam University adapted the model to create its assessment essentials. Listen to our podcast to find out more about the development of the lifecycle and how others have used it, or read the full text transcript. The lifecycle is one route into this guidance. You will find a full description of each life cycle element along with common challenges faced by institutions in getting this aspect to work well, how to support it with technology and resources to highlight good practice. If your role involves managing administrative processes or IT systems you may find that this is the most helpful overview for you.